On June 12th, the announcement became public and official- yes, the Fab Four were to be decorated at Buckingham Palace by her majesty, Queen Elizabeth. And so, thus agreed upon, it was all set. But not so with several previous M.B.E winners. Many of those medal bearers actually returned their medals in protest. After going through the standard rehearsals amid several hundred other awardees, the Queen entered and bestowed each of the Beatles with their M.B.E. medals. With hundreds of other awardees, there wasn’t much time for her majesty to kibitz. John took his medal, almost immediately, to his Aunt Mimi’s home. (He had been separated from his parents as a youth and was raised by his aunt.) John entered Mimi’s home, pinned the M.B.E. 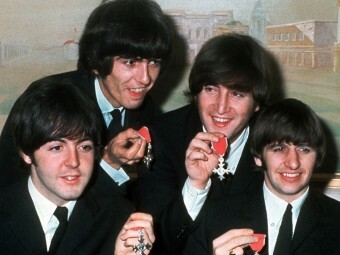 medal on her and graciously said, “Here, you deserve this more than I do.” Lennon’s M.B.E. medal was to spend the next four years atop Aunt Mimi’s television set.